The hidden colours of an ancient Egyptian coffin are revealed through a combination of analysis and non-invasive multispectral imaging techniques. Here Joanne Dyer and Nicola Newman shed light on the process. A colour reconstruction by illustrator Claire Thorne of the mummy and jars scene found on the outer coffin of Nestawedjat (EA22813A), based on the information provided by multispectral imaging and analysis. The wooden outer coffin of the mummified Nestawedjat, Lady of the House, daughter of Djedmutefankh, found at Thebes, dates from the 25th Dynasty (700–680 BC). Once richly decorated with multi-coloured images, the lid is now severely blackened, perhaps due to past fire damage, which not only obscures the original design but also much of the meaning behind the concealed iconography. The lid of the outer coffin of a mummy from the British Museum undergoing multispectral imaging in the studio by conservator Nicola Newman (left) and scientist Joanne Dyer (right). Using a combination of analysis and non-invasive multispectral imaging (MSI) techniques, the Museum’s Departments of Conservation and Scientific Research are now able to reveal the colours hidden for thousands of years. An infrared-reflected (IRR) image of the mummy and jars scene found on the lid of the outer coffin of Nestawedjat (EA22813A). Illumination with highly penetrative infrared radiation allows greater contrast between the infrared opaque materials, such as the carbon-based pigments (which appear dark) used for the under drawings and outlines, and infrared transparent materials (which appear lighter). A visible reflected light image of the mummy and jars scene found on the lid of the outer coffin of Nestawedjat (EA22813A), showing the blackened surface of the lid. 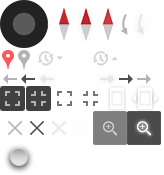 Much of the detail of this scene is illegible with the naked eye. Using highly penetrative infrared radiation, infrared-reflected (IRR) images were collected. These images showed that the under drawings and outlines were made with an infrared opaque carbon-based pigment, such as soot or carbon black. The greater contrast between this and infrared transparent materials made possible by this technique allows details of the scenes, such as the one with the mummy and jars (see above), to be more easily seen. The images reveal more sharply defined and interpretable hieroglyphs, a clearer view of the decorative details and previously unseen features of the mummy’s face and wrappings, as well as a clearer view of the canopic jars, which allowed the gods they represent to be identified. A visible-induced infrared luminescence (VIL) image of the mummy and jars scene found on the lid of the outer coffin of Nestawedjat (EA22813A). The pigment Egyptian blue appears bright white in these images. The visible-induced infrared (VIL) imaging technique is used to identify and locate the presence of the pigment Egyptian blue, which appears bright white in these images (see above). Egyptian blue is produced by heating together quartz sand, a copper compound, calcium carbonate, and a small amount of an alkali (ash or natron) at temperatures ranging between 800°C and 1,000°C. It can then be ground to a fine powder, mixed with binder and painted onto a surface. Although some areas of Egyptian blue pigment are evident with the naked eye, the VIL image of the mummy and jars scene shows that the distribution of blue pigment is more widespread than at first observed and that much of the detail which now appears dark would have originally been bright blue. Using all the information gathered from the multispectral imaging, along with the analysis of microsamples taken from the coffin a colour reconstruction of the mummy and jars scene has been created. 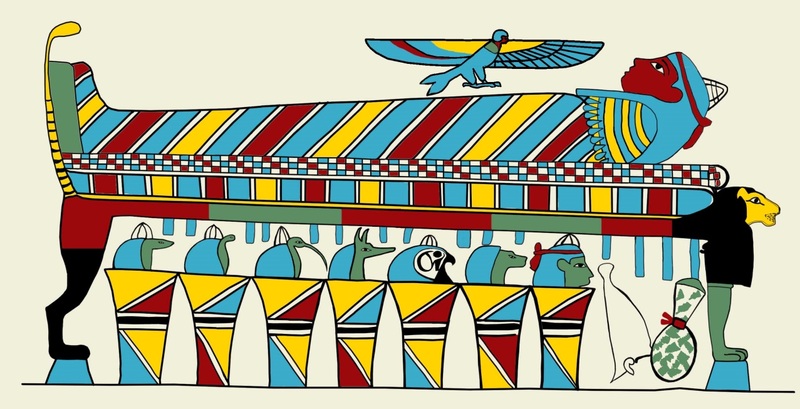 The illustration reveals the range of colours that would have been used to decorate the coffin – bringing back to life what has been hidden for millennia. A colour reconstruction by illustrator Claire Thorne of the mummy and jars scene found on the outer coffin of Nestawedjat (EA22813,a), based on the information provided by multispectral imaging and analysis. This work features as part of the exhibition Egyptian Mummies: Exploring Ancient Lives at the Powerhouse Museum in Sydney, Australia from 10 December 2016 to 25 April 2017.